This week, we’re honoring our love of gardening by taking a hard look at our rusty, underperforming hand tools, and seeing if there might be a better way to approach our routine gardening tasks. Gardeners really vary on how we like to deal with the trimmings and weeds we create when doing the rounds in our gardens. I’ve seen everything from people leaving the twigs and weeds to compost where they fall (be careful with that technique! ), to gardeners with giant apron pockets which hold surprising amounts of weeds, to people leaving neat piles of weeds and trimmings, which they collect at the end of the day with a wheelbarrow. But I’m a professional. You aren’t going to catch any self-respecting pro piling weeds into her pockets or leaving bits about! So I’ve compiled a few of my favorite options for keeping things neat while gardening. Collapsible leaf bags are usually made of a sturdy, water-resistant cloth or vinyl, and have a coiled wire frame which springs upright for gardening and crushes down easily for storage. Some kinds come with zippered lids, and they’re available with or without a hard shell at the bottom, which can help keep the bag from tearing if you tend to drag it along the ground when it’s full. This is an ideal option if you don’t compost on site. If you put your green waste in your car and take it to the dump for composting, this is great because the containers are often just the right size for going in a trunk or backseat. Most are sized perfectly so you can put a trash or leaf bag inside, which keeps the inside of the container clean and nice, and when you’re done with the day’s work, it’s wonderful to be able to crush it into a 4” thick hoop and store it easily. These are tall enough that they are inconvenient to work directly into unless you are standing to prune, so you will still need a bucket or something to weed into. They are also large enough to be hard to lift if filled entirely with heavy weeds. They also aren’t as sturdy as some other options, so if you are hard on tools or garden professionally, this isn’t your best option. Collapsible leaf bags are great for homeowners who have to transport green waste in the car or do a lot of deadheading or trimming. Check out my favorite collapsible leaf bag at my gardening shop! Canvas tool caddies can make that old laundry detergent bucket into a convenient way of carrying tools around and having a small place to toss weeds as you work. Buckets with a tool caddy fit into small spaces, so if you want something to keep by the door for those quick weeding sessions, this is your best bet. 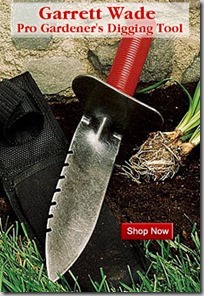 It could easily live outside on a covered patio if you only kept a few rugged tools in it. You can tuck a kitchen trash bag into it so that you don’t have to tip it upside-down to get the weeds out. You ever fill a bucket with something heavy, like wet clay clinging to weed roots, and then bang it against your leg? Ouch! The bottom edge of the bucket seems innocent enough, but I’ve gotten some nasty bruises from lugging full buckets about. The handle is also terrible. It’s uncomfortable to lift and often flops down in your way. Bucket handles are made for economy, not ergonomics. Using a tool caddy with your bucket makes it impossible for you to tip your bucket upside-down without emptying your tools. This means the bucket is less multi-use with a caddy on, since you can’t water things with it (not that you’d want to anyway as there’s no pouring spout) or scoop up mulch or soil with it. 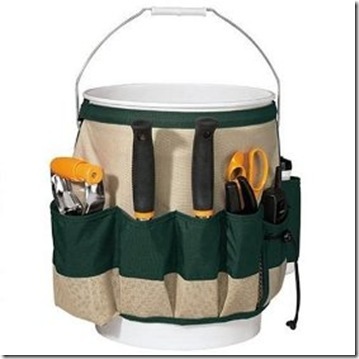 A bucket with a tool caddy is a great option if you regularly go out for 15-minute rounds of weeding or deadheading and want to keep your tools close. It’s not great if you work for longer stretches of time. These meet all my standards for being multi-use. I put my tools in them and carry my tools out to the garden area I want to work in, then dump the tools out and toss green waste into my tubtrug. The fact that the top almost closes when I grip the handles means I can even pile long-handled tools into them and carry all my tools in one hand. They hold water and the tub forms a pouring spout when you hold both handles in one hand, so you can use it for fertilizing or watering in new plants. The flexible top even makes it useful as a dustpan in a pinch! I can set it on its side and it forms to the ground, making it perfect for scooping up autumn leaves or soil. The handles are ergonomically designed to be comfy to grip, and the base is rounded so it won’t bruise your legs if you bang it against yourself while walking. And they are long-lasting. I can’t see any signs of real wear or damage on mine, after a full two years of almost daily professional use. I use the 10-gallon size, but there are smaller ones available too. You’ll have to keep a close eye on your tools, because it’s tempting to set your trowel or pruners down on top of the green waste in the tub. I’ve watched more than one person grumpily sorting through their compost bin for their $30 hori-hori! Tubtrugs are the toughest and most multi-purpose option, and they’re easily my favorite. If you’re like me and don’t want to run back inside for a watering can, scooping shovel, or dustpan when you’re in the middle of a project, a tubtrug might be your best option too. Since we’re on the topic of garden waste, let’s talk briefly about these other garden helpers. Tarps are awesome for setting longer branches on, or things that aren’t too heavy to lift, like autumn leaves or the mass of leaves from pruning Miscanthus grass. Be sure and set your branches going all in one direction so the tarp’s easy to lift and carry. You can even tie a rope around the tarp and trimmings to make an easy-to-carry bundle. Try not to drag your tarp along concrete – it’s easy to wear holes in them. Contractor bags are just like a normal trash bag, but they are much thicker, which means you can re-use them many times before they break. If you have to take green waste in your car or truck, this can be a good option for keeping things neat. Wheelbarrows are great if you’re moving green waste to an on-site compost pile. Many people prefer the type with two wheels – if you’ve ever overfilled your wheelbarrow and had it tip over, you’ll know it’s possible to strain your back, or at best make a decent mess with the one-wheel kinds. Of course, the two-wheel kinds are heavier and less able to maneuver through tight areas, so it’s a matter of preference as to which is best for you. What do you use in your garden? I hope you’ve found these comparisons helpful! Do you use any of these things in your garden, or what tricks have you found that work for you? Let me know in the comments below! I have used a variety of ‘ weed-holders’ as a professional gardener and have to say the collapsible bags are great. For low down work just leave the top of the bag tied to the bottom until it is too full to use this way. They are also great to support a trash/bin bag until that is full. Space in my car is paramount, so something collapsible is a must. I’ll have to go with the tool bucket. Neat! I’ll have everything I need near me. I look forward to the day my Felco No. 8s have a tracking chip embedded. I think half of my gardening and orchard time is spent looking for those puppies. 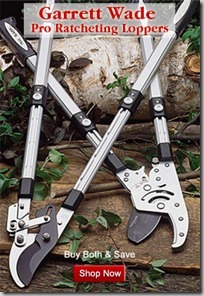 The pruner of the future! Great info — thanks. In a very odd way, this post reminds me of how wonderful it was, as a children’s librarian, to find just the right reference book that had the answer to that 2nd grader’s all-important question. Without the right tools my job would have been all but impossible. That tubtrug must have been an unabridged reference book in a previous life. I love it. Usually I just shlepp a small bucket around which doesn’t work well at all since it has to be emptied every 15 minutes. And different sizes for different tasks – a librarian’s dream. AND it comes in purple . . . . Life is good. Fern, I think the bucket sounds awesome for you! The heaviest things are really clay clods clinging to weeds, so I’m guessing you’ll be good. Blossom, thanks so much for stopping by! It’s lovely to see your blog. Monica, I just love your solution for making a bucket work better – awesome. Us pros have such detailed solutions for things since we come up against problems in our work so often. I’m going to remember your tip. Tom, yes, we’d save so much time!!! I have a littte holster for my pruners so don’t lose those, but my hori-hori disappears fairly regularly. Luckily I’m used to keeping track of it so I rarely lose it for more than a few minutes! Iona, I love that you were a children’s librarian – just love it. I’m honored to have my favorite tool compared to an unabridged reference book, and I know just what you mean. I have a lot of books and they are all so very different, it’s hard to get rid of them even if I have multiple books on the topic, since the emphasis can be so different in each. I think it can be the same with tools. And yes, oh my gosh PURPLE!!! My favorite color, too. They only had green locally when I bought mine, but if I ever have to re-order it will be all purple for me and my employees! 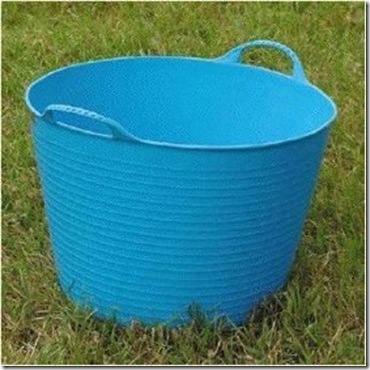 Tub trugs feel a little too precious for me… I like the good old fashioned 5 gallon bucket. No tool caddy, again it feels fussy and unnecessary to me. …My tools fit inside it for transport, and usually I’m not packing anything more than a hori hori in my back pocket, a pair of Coronas on my belt, maybe a pruning saw, maybe a pair of loppers, maybe some hedge sheers and a water bottle (for me, not the plants). I like the bucket because (a) I’m not buying something new when something old and recycled already works well for me; (b) it is, as you say, the perfect height — though I don’t find the handle gets in the way at all; (c) I find the handle perfectly comfortable if I’m not overfilling the bucket; (d) while perhaps a little awkward for watering delicate plants or potted plants, I think it works just fine as a watering can for most plants in the ground; (e) it partners well with paper yard waste bags or a tarp for bigger projects or projects with multiple gardeners at work. Totally agree with you on the tarp — it’s an unsung hero. The tarp is, quite possibly, my favorite gardening tool. It’s fascinating to see what other people like and what they value in a garden tool. Our tool choices are, clearly, very personal. I suppose it does come down to what we like, what feels good, what’s effective and how much work we need to or want to put into garden tasks. I use a tub trug, if nothing else, you’re not likely to lose it (they’re all bright colors). And I like that they are light and squishy. Hands down best tote I have ever used was a large sheet of Burlap. I first used these when doing landscape rounds for the contractor that I worked for in high school. But for sheer volume, if you can lift it, the burlap is best. Also try using and old flannel bed sheet. Just pile stuff on till it piles over the edge, then tie the opposite corners and stuff some more. I can clear my front yard in about five or six loads (leaves from the 80′ by 50′ BLack Walnut) Works well when combined with wheel barrel because you can just stuff way more into the sheet that the barrel. Gen, Wonderful review! 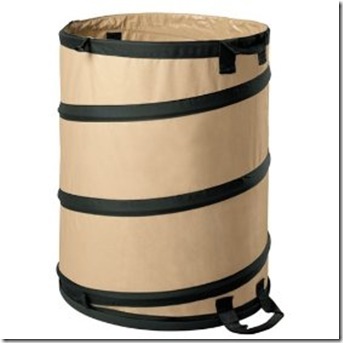 The Tubtrug will be on my wish list (when I can settle on a color–they sure know their market!) I have to sheepishly admit to using a brown paper grocery bag. When full of deadheading it goes in the compost bin. Full of weeds it goes in the County yard waste container (our compost pile is not super hot right now). We have a collapsible thingy too, and you’re right, it’s too high to use when kneeling and weeding. 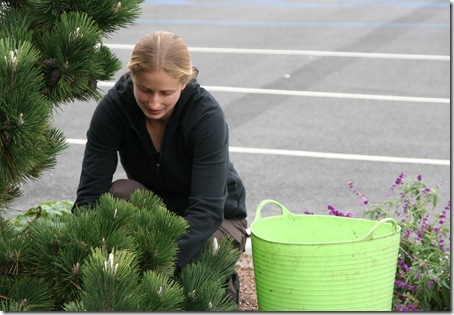 Daffodil Planter’s last blog post..Are you one of these difficult garden center customers? Years ago I had a light strong plastic square with corner handles for collecting bulky garden waste. Anyone come across one. I would call this a small drugget with handles but nothing is coming up on the net. it was especially good for carrying prickly branches. Mary, I have seen these too, but can’t find them online. How strange! They are a great product. If you find them, please do let me know. I too have googled after reading your note and can’t find them.